Well, it’s official. After week-after-week of episodes that hovered in the good-not-great range, The Goldbergs has just unveiled its funniest, sharpest episode yet. “Shopping” finds the cast and crew firing on all cylinders. Not all of the jokes work but—like the ’80s era Zucker-Abrahams-Zucker parodies that no doubt helped formulate Adam F. Goldberg’s brand of humor—the zingers and gags come so hard and fast that you have little time to contemplate a failed joke before a much better one quickly takes its spot. Via a very funny opening montage, the episode quickly establishes Beverly’s predilection for bargain hunting before laying the groundwork for the week’s conflict. Fed up with not having her own income, Erica Goldberg gets a job at a local boutique store, leading Beverly to take full advantage of her daughter’s newfound employee discount. Realizing that Beverly’s constant purchases could very well get her fired, Erica frames her mother for shoplifting, thus ensuring she can never come back to the store. When a furious Beverly approaches her about the set-up, Erica makes an ill-advised, heated comment: Beverly’s position as a housewife is not a real job. An outraged Beverly responds by promptly going on strike. I’ve been waiting the whole season to see what a Beverly-Erica confrontation would look like, and the writers do not disappoint. Erica is not at all wrong in believing that Beverly’s bargain hunting is a tad excessive, but her approach to the issue—getting Beverly arrested, demeaning her lifestyle—does seem a bit extreme. Then again, as someone who grew up in an environment rife with fights between my older sisters and mother, the show’s take on the situation is certainly not exaggerated to the point where the story strains credulity. Comedy aside, the plotline also manages to incorporate the show’s requisite third-act sentimentality in a way that’s both organic and effective. Of particular note is the final scene where Beverly comes downstairs to find that her family, as a token of their appreciation, has cooked the night’s dinner. The food, naturally, turns out to be inedible, but the sentiment was heartfelt enough. On another note, whereas many of the show’s previous episodes have suffered from B plots that were either underdeveloped, unmemorable or just plain weak, this week’s subplot arguably equaled the main story in quality. Discouraged by his string of bad luck, Barry accompanies Albert and Adam to the racetrack in an attempt to break his streak. His horse finishes last, but Albert and Adam convince a pathetic Barry that this is a positive outcome (much like how, in golf, the winner is the one with the lowest score). Barry buys this lie hook, line and sinker then proceeds to strut around the rest of the episode convinced he’s brimming with luck, much to Adam’s annoyance. 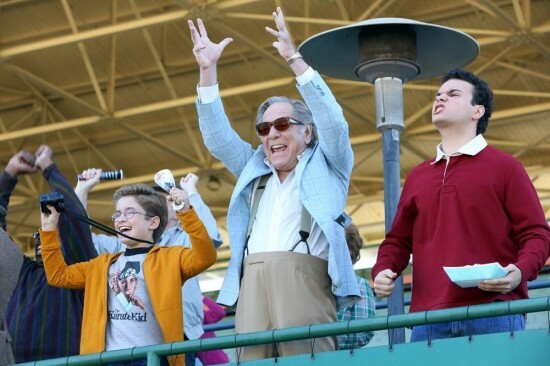 With “Shopping,” The Goldbergs have their first unabashed home run of the season. The next few episodes will determine whether or not the show can keep up this momentum for the rest of the season. Ever since the pilot, I’ve been waiting for the show to fix its glitches and hit its stride. Now—hopefully, I’m not jinxing the program’s chances by saying this—it feels as though all the pieces might have just clicked into place.